Carol Cano, M.A., began her practice over 30 years ago at Wat Kow Tahm in Thailand and has actively engaged in building communities and teaching Dharma internationally. She has completed a myriad of training programs at Spirit Rock Meditation Center and is currently participating in their Retreat Teacher Training. Carol is a core teacher and was a former board member of East Bay Meditation Center. 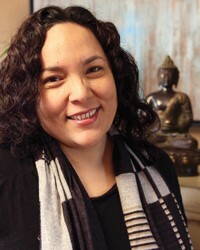 Carol co-founded Philippine Insight Meditation Community in Philippines. Her unique teachings are deeply grounded in Basque, Native American and Buddhist influences that braid the Dharma along indigenous wisdom and Earth-based practices. Carol reminds us to keep grounded in our hearts as we uphold spiritual ideals and encourages us to remain balanced within the demands of modern life. To find out more about Carol, please visit www.carolcano.com.